116227: added octave -3 setting (by pressing octave - one more time). Added CC support for MiniBrute Connection parameters (see user manual). You can get the version, and start MiniBrute Connection software, to update your machine using Firmware tab. Beta test period is over, and this version has now been officially validated. A large number of Minibrute owners, Arturia customers, you know the people who buy the products that pay your salary? Well they requested local off and I see you have finally included it (almost 2 years after the initial requests and I suspect only because of the new Minibrute SE). Well done, except for one problem... you have not provided information on how to implement it. Do you guys purposely try to annoy your customers or is it just incompetence? Or maybe it's just an oversight after a week of work? By the way, it took me 1 minute to find out! Maybe there is another way but i use MIDI CC number 122 messages: with a value of 127 local is ON, with a value of 0 local is OFF. Just test it in logic pro, working great. At your own risk if it's not the "official" way to do it. you have not provided information on how to implement it. It's implemented as described in the MIDI specification(MIDI CC number 122), we usually don't provide implementation details on what is standard. could you please tell me the "Standard CCs" for LFO re-triggering and Arpeggiator mode? but do I get it right, local off function just works with se and not with the old black one? 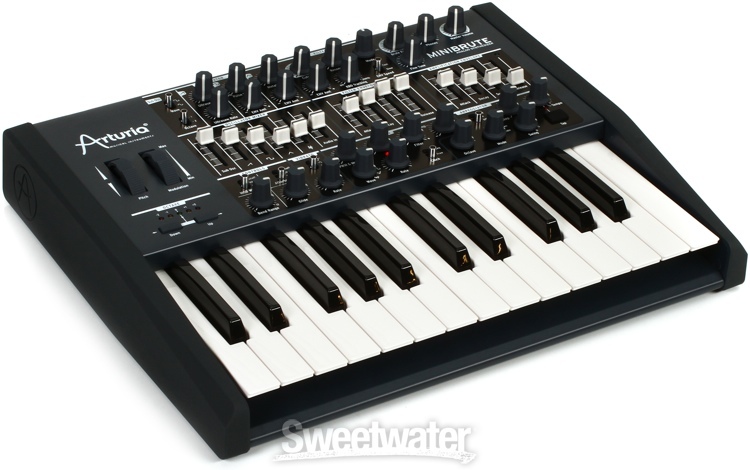 I can't just try myself, because I sold my minibrute (shame on me) now thinking of buying a black one again if its got local off. Sorry to be somewhat off topic, but by 'black one' do you guys mean 'blue one'? Because my minibrute is blue. interesting, I wouldn't call that one blue at all. But yep, that's what he's talking about. Thanks for this release Bruno et al. I'm curious though as though as to why no email was sent to registered users about the update nor was it included in the Arturia newsletter. This firmware update is quite significant, I would think Arturia would want to spread the word for those Minibrute users who opt not to participate in the forum. Just my .02.